Fudge Frosted Brownies… beyond decadent! I was craving brownies the other day and decided to make up a batch of my fudge frosted bad boys… decadent, delicious, and pretty easy to whip up. The base is a chocolate chip brownie, then frosted with a thick layer of “fudge”. What’s with the “quotes”? So here’s the deal, I don’t like to top the brownies with a full blown fudge because that’s awfully dense and would make them difficult to eat. 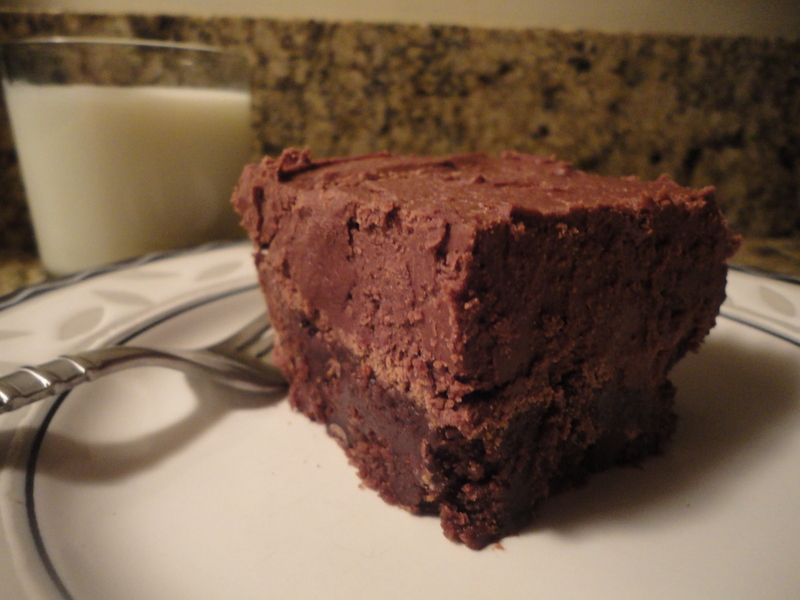 Instead I prepare a take on a traditional fudge base, but then mix it with confectioner’s sugar and cocoa powder, giving it just enough softness that it creates a textural contrast from the moderately dense brownie and is easier to eat, but still has that same rich, decadent fudge flavor. The end product is absolutely delicious, and really easy to make! Note: The brownies are very good by themselves, so if you don’t want to do the fudge frosting you’ll still have a great treat. In a stand mixer, or a large bowl with a hand mixer, combine your melted butter and granulated sugar at high speed for about 3 minutes. Add the vanilla extract and eggs, mix well until a mousse is formed. Add the flour, cocoa powder, salt and baking powder and mix until a batter is formed, starting a low setting and working up to medium. Stir in the chocolate chips. Pour the brownie batter into the greased dish and bake at 350F for 30-35 minutes. Remove from the oven and allow to cool at room temperature. Once the brownies are cool it’s time to make the fudge frosting. Put the stick of butter, heavy cream and vanilla extract in a medium sauce pot (preferably non-stick) and heat on low until the butter is melted, stirring periodically. Add the semi-sweet chocolate and continue to cook on low heat, stirring continuously, until the chocolate is melted into the liquid. In a stand mixer, or a large bowl to use with a hand mixer, combine the confectioner’s sugar, cocoa powder and salt. Add the fudge base to the dry ingredients and mix for 5 minutes, starting on low and working up to medium speed. Evenly pour the fudge frosting over the cooled brownies to a desired thickness, then place in the refrigerator to cool and set. Remove the brownies from the fridge 30 minutes prior to cutting and serving. Note: The ingredients listed are for a thick fudge layer to top the brownies, however, if you want a thinner layer you can cut the ingredients in half. There you have it, my Fudge Frosted Brownie recipe. Pour yourself a glass of milk, or maybe some Bailey’s Irish Cream, and enjoy!!! Tags: baking, brownies, chips, chocolate, cocoa, cooking, decadent, fudge, perfect pairings, perfectpairing at home, sweet, sweets. Bookmark the permalink.